1 2 3 4 5 Click to share your rating 5 ratings (4.8/5.0 average) Thanks for your vote! 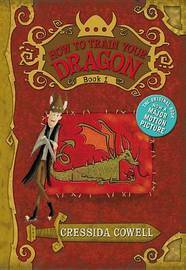 24.59% of people buy How to Train Your Dragon (How to Train Your Dragon #1) and How to Be a Pirate (How to Train Your Dragon #2) ~ Paperback / softback ~ Cressida Cowell. Packed with energetic black-and-white drawings and plenty of action, read the original book that inspired the How to Train Your Dragon film! This book will be a hit with children and adults alike. Hiccup Horrendous Haddock III was an awesome sword-fighter, a dragon-whisperer and the greatest Viking Hero who ever lived. But it wasn't always like that. In fact, in the beginning, Hiccup Horrendous Haddock III was the most put upon Viking you'd ever seen. Not loud enough to make himself heard at dinner with his father, Stoick the Vast; not hard enough to beat his chief rival, Snotlout, at Bashyball, the number one school sport and CERTAINLY not stupid enough to go into a cave full of dragons to find a pet… It's time for Hiccup to learn how to be a Hero.